Crassula ovata, commonly known as jade plant, friendship tree, lucky plant, or money tree, is a succulent plant with small pink or white flowers. It is native to South Africa, and is common as a houseplant worldwide. It is sometimes referred to as the money tree; however, Pachira aquatica also receives this nickname. The jade plant is an evergreen with thick branches. It has thick, shiny, smooth, leaves that grow in opposing pairs along the branches. Leaves are a rich jade green, although some may appear to be more of a yellow-green. Some varieties may develop a red tinge on the edges of leaves when exposed to high levels of sunlight. New stem growth is the same color and texture as the leaves, but becomes brown and woody with age. Under the right conditions, they may produce small white or pink star-like flowers in early spring. As a succulent, Crassula ovata requires little water in the summer, and even less in the winter. The jade plant is a little susceptible to overwatering. C. ovata is famous for garnishing a red tinge around its leaves when grown with bright sunlight. In more extreme cases, the green colour of the plant is lost and can be replaced by yellow. This is caused by the jade plant making pigments such as carotenoids to protect from harsh sunlight and ultraviolet rays. The jade plant also does best in rich, well-draining soil. The plant also flowers in the wintertime, particularly during a cooler, darker, dry spell. C. ovata is sometimes attacked by mealybugs, a common nuisance of the succulents. The jade plant is also known for its ease of propagation, which can be spurred by clippings or even stray leaves which fall from the plant. Jade plants propagate readily from both with success rates higher with cuttings. In the wild, propagation is the jade plant's main method of reproduction. 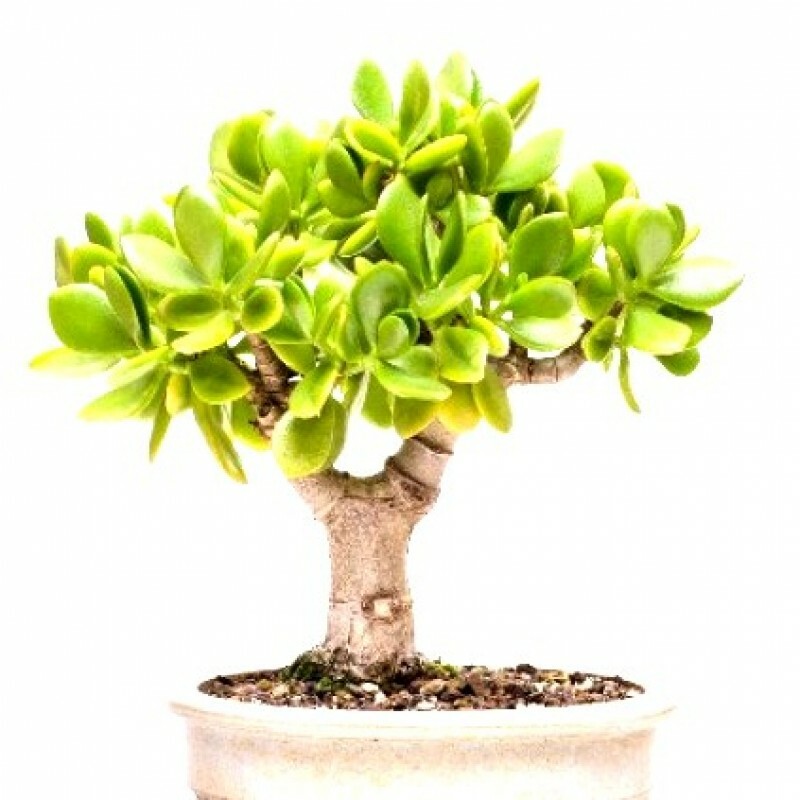 Branches regularly fall off wild jade plants and these branches may root and form new plants. Like many succulents, jade plants can be propagated from just the swollen leaves which grow in pairs on the stems. While propagation methods may vary, most will follow similar steps. Typically, the wounds on the leaves are left to dry and callous over. Then the leaves are placed in or on soil. Roots begin to grow on severed leaves about 4 weeks after being removed from the stem. Environmental factors such as temperature and humidity affect the speed at which the roots and new plant develop. Foliage usually appears soon after new roots have formed. The jade plant is well known for its bonsai capabilities, since it forms a bonsai very easily when pruning is done correctly. Many who learn bonsai begin with a jade plant, since they are durable, easy to put through the bonsai process, and attractive. plants height with pot is 9 inch to 1 feet and pot size is 5'' diameter. Beautiful plant useful for lucky plants, table top & gifts. Annual & hardy plant, low maintenance.